A couple of years ago, our cast of denizens atop the entertainment center in our living room helped us re-imagine the Christmas story. They've been doing it faithfully for several years now. I chronicled some of those events in a previous blog. Unfortunately, during a season like this you would like peace and goodwill to prevail, but, as reality will often do, even the Christmas season is not immune from its reach. I have refrained from writing about these events before now, but my lawyer assures me the the case has finally been settled and there will be no repercussions to my telling my side. I represent the League of Crechepersons International. 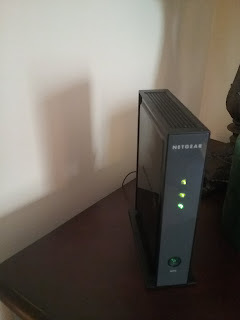 It has come to our attention that you have placed, within the last year, an enormous glowing box for your internet within close proximity to our stable. This is not only in violation of our agreement, it is dangerous to all concerned. The effects of the rays and other dangerous waves released from these boxes has been known to cause tumors in both sheep and shepherds, to disrupt the peace and well-being of persons of the town, to cause kings to lose their sense of direction, and even to cause birth defects in baby Jesi. We therefore demand that you move your box from this location IMMEDIATELY in order to avoid legal action. What would you do with a letter like that? I consider myself a reasonable human being (just like everyone else), but the tone of the letter really peeved me. There was no attempt to understand my position; besides, did he really have to capitalize IMMEDIATELY? And what was this mysterious agreement he claimed I was in violation of? Probably he had pulled this from his legal posterior. And while I am certainly aware of the possibility of things in the environment causing ill effects, could one small tower possibly log such a litany of terrors? Surely not. I wrote him back and told him that the presence of the creche people was voluntary and that due to our internet provider drilling a rather intrusive hole in the wall some months ago our box could not be relocated, whereas our creche most certainly could be, even to the other end of the entertainment center, several feet away. Anywhere else and the figures would most likely meet a much quicker end than any router-derived radiation at the paws of our cat. He did not appreciate the part about our cat: evidently lawyers are paid vast sums of money to interpret anything they can to the advantage of their clients, and by simply pointing out to him that there were dangers in the world beyond the one he was concerned about he decided I was threatening the safety of his clients. 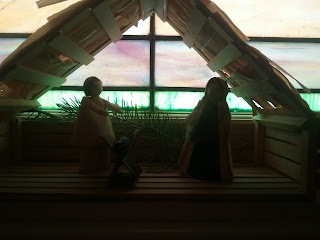 He also made me aware that my use of the term "creche people" was not at all welcome, being derogatory. I told him I had no intention of being offensive and that I would use any term that was acceptable to all parties concerned and apologized, and he simply told me I should have known better and reiterated his disdain; despite my repeated attempts he never let me in on what was the proper term so I think he was mainly concerned about making me look bad rather than trying to promote justice. Since interruption of the internet was a serious matter I went about looking for a lawyer. Would you believe one of the wise men had a JD? This was certainly going to make it easier to communicate; I tried to overlook the possible conflict of interest and hoped that the other wiseguys didn't beat him up when they found out. My lawyer immediately suggested we try to settle out of court. One night we had a meeting of the minds. Things did not go well at first; my own counsel had to suggest I not use the term "straw man" in sizing up opposing counsel's argument. It did seem to me a bit exaggerated until I was shown a safety video in which several individuals-a-creche were seen to be suffering some pretty horrible effects from cable and internet boxes thoughtlessly placed in their vicinity, and all in the name of unpaid and uncared-for creche figures bringing graphic representation of a story at the very heart of the holiday. It amounted to the most rude exploitation, opposing counsel said. It turned my stomach. I said I was sorry; I hadn't known, and he gave me a frustrated look that must be common to many among the frustrated when they have to deal with the clueless. After that things proceeded quickly. I was told that the box needed to be a few hundred feet away; however, when converting their distances to mine it turned out only to be a couple of feet, which was even less than my original offer. I was also ordered to pay a heavy fine. Seeing the look of worry on my face the arbiter quickly added that, as the persons involved were more used to a Medieval economy, they could be paid in foodstuffs. This turned out to be a year's supply for the entire cast, or one cookie. 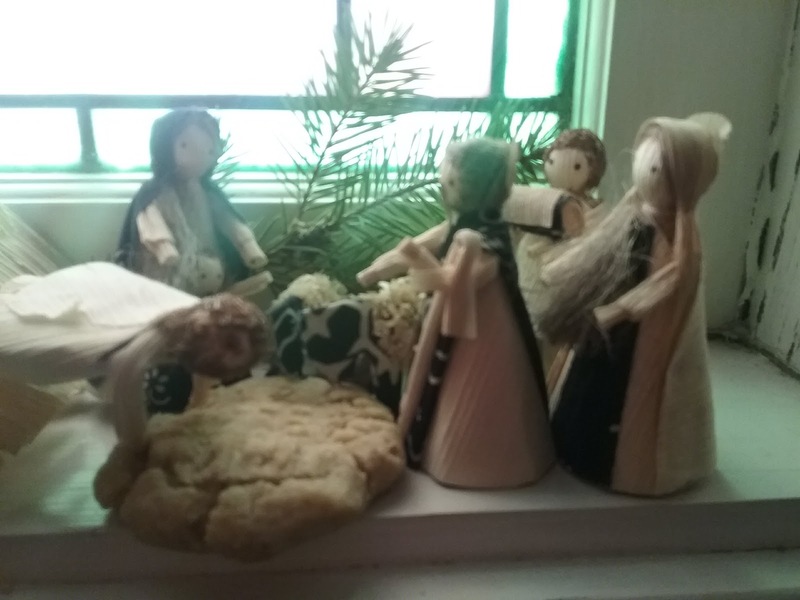 I timidly offered them a thimble of milk as well, as a good will gesture, and they were quite happy. I think they believed I was a rather broken individual by this time. However, after Santa takes his cut, I will only have to go without one more cookie at Christmas. I think I can live with that. A year ago I was new in town, just getting over aggressive chemotherapy treatments, and without a job. I'm a musician, so that obviously means finding a keyboard instrument that is lonely and wants me to play it. 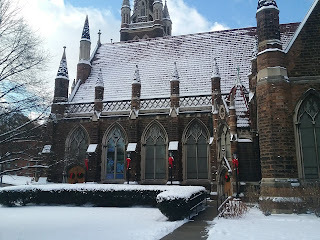 It so happens that the folks at Third Presbyterian were looking for an organist, although I wouldn't find that out until February, and not get hired until the last day of April. I started Pentecost Sunday, this past June. 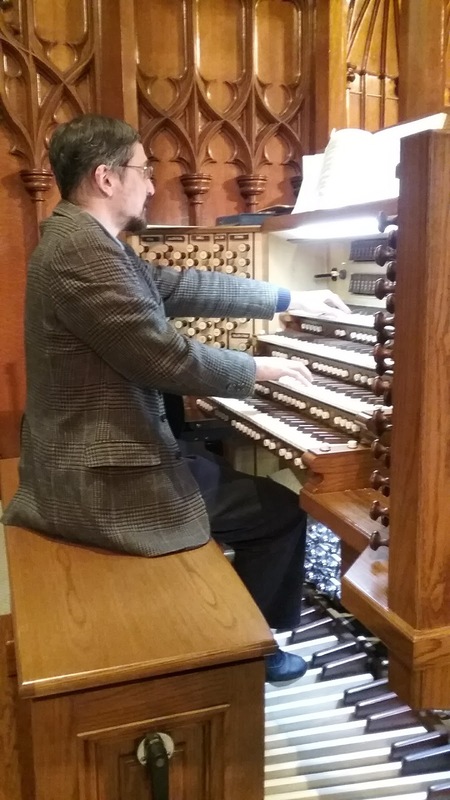 It is strange, but my first week as substitute organist (back in March) was the week the new console was installed. 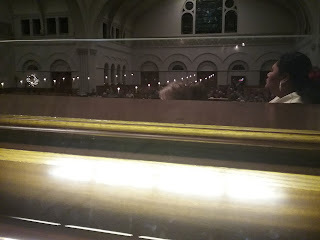 I took a break from practicing the chapel organ to see what was going on in the sanctuary and happened to catch it being wheeled down the aisle. 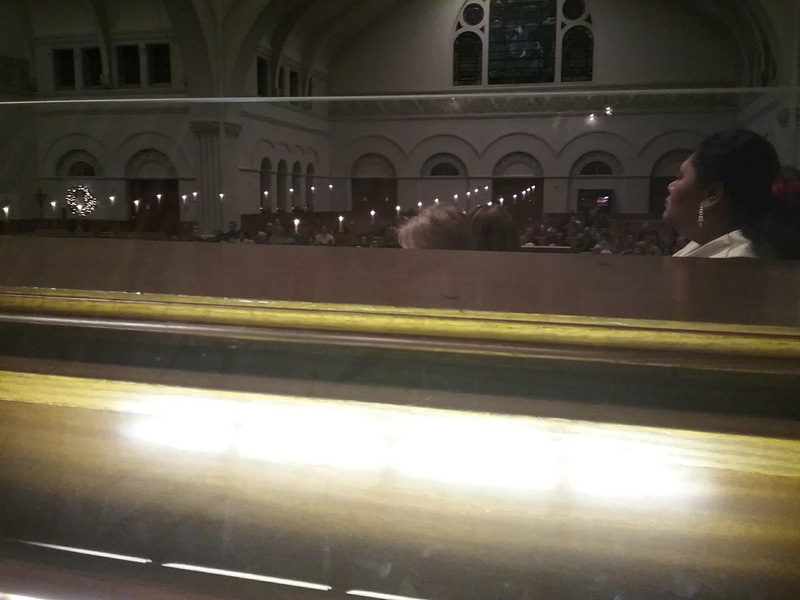 What does one play for an organ rolling down an aisle? It is my seventh month with the people of Third, and my first Christmas. The start of new traditions, surrounded by a new community. The Christmas decorations went up in our picturesque sanctuary a month ago. 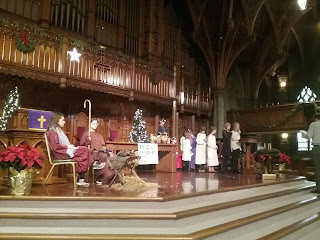 A week ago we had our Christmas pageant. We have plenty of other things going on in the building as well. 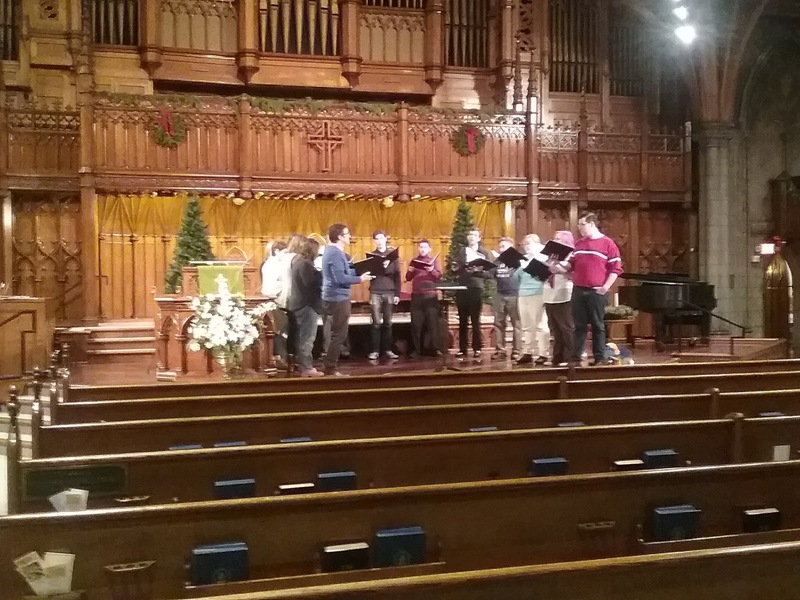 Concerts by groups around Pittsburgh and our own church folks are some of them. We also have a sewing mission in the basement. That's Lenny, our choir director, and his wife, Raquel, a singer. We put on a concert together in November. I happen to like the outside of the building, but some people probably find it forbidding. Inside, however, is not only beautiful, but warm and friendly. 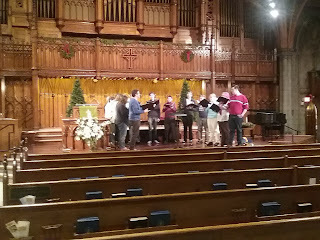 Sunday night we'll be singing all the familiar carols. Since we are a very "good" church and don't sing our carols until Christmas, I'm excited to finally get to play them. Despite our organ being in disrepair and currently only half complete, I have over a hundred ranks (sounds) to choose from and the congregation, choir, and I will make the rafters ring. If you are in the area and would like/need/want something wonderful to do/be at on Christmas Eve, consider this an invitation. 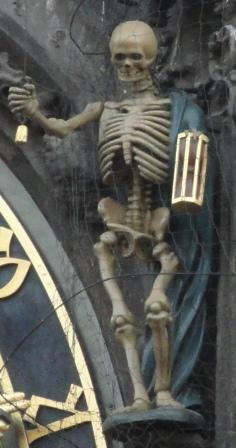 I may not know you yet, but if you hang out near the organ, the goofy looking guy with the glasses will say hello. We're at the corner of Fifth and Negley in the Shadyside neighborhood. Christmases have been behaving a bit strangely lately. In my years in Illinois the month of December was one blast of musical obligations, one massive joy-spreading enterprise guaranteed to leave you gasping for breath when it was over. Last year, after cancer and a move to Pittsburgh my phone barely rang, and the few gigs I almost got had already been taken by the time I knew about them. The first of these was a concert at First United Methodist in Pittsburgh, about a mile from where I pull the stops regularly. 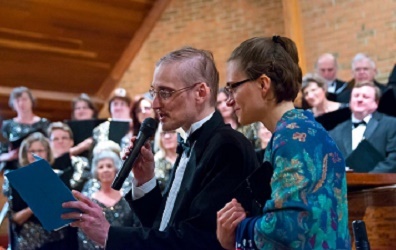 Tim Coles, the music director, let me practice at his church back in February when I didn't have a musical home, and even offered me this gig which was the only one on the books for a while. 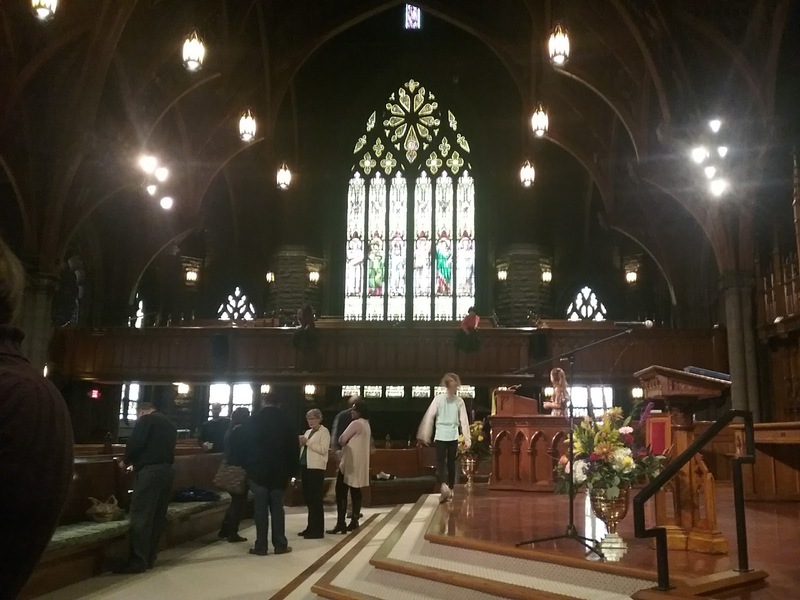 This concert/worship service is an annual event, and this year it included a bell choir, a recorder ensemble, the chancel choir, and ensembles of strings and brass. I played the piano for a couple of selections with the strings and choir, and mostly the organ, with the strings for a movement of the Vivaldi Gloria, and with the brass for the evening's main course, the John Rutter Gloria. I also played a couple of organ solo pieces. This concert was a bit of therapy, since I am not currently working with any choral organizations, and I have fond memories of the Craig Jessop festival extravaganzas with The Choral, frequently featuring works by John Rutter. I did not serve as the rehearsal pianist this time, so I missed the transition from vocal score to member of the ensemble and the chance to complain that all of my favorite notes got taken away. 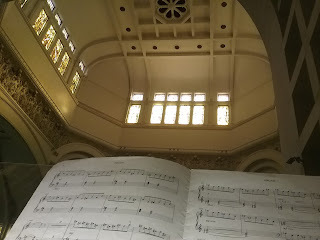 Although Mr. Rutter has written a nice organ part--the second movement is largely for choir and organ alone (and in some cases just organ) and there are a few bits where you can hear the organ during the outer movements. But the overall effect is what counts and it is a well written study in contrasts and climaxes. One hallmark of those Illinois concerts was the terrible sight-lines between myself and the conductor. You should know that the choir was again between myself and the conductor such that it was completely impossible to even try to see him. I gave up and watched most of the concert on television. Although closed-circuit Tim was only a couple of inches high and his baton was even smaller it was still visible and things worked out pretty well. Plus I could watch the Discovery channel during the parts I wasn't playing. 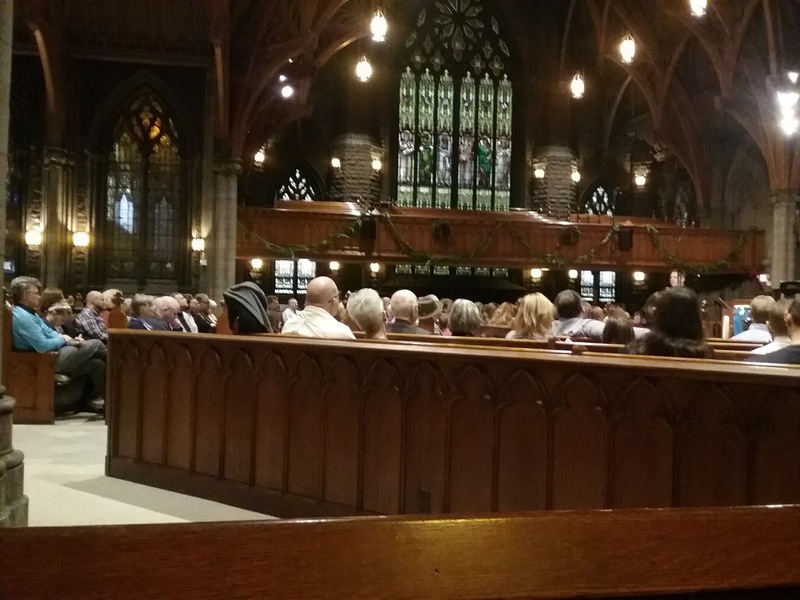 There are candles at the ends of the aisles which, from my vantage point, appear to be floating . 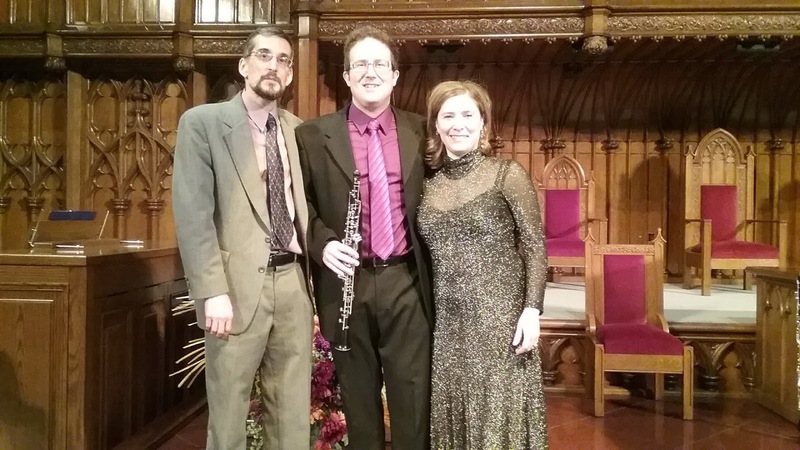 The second concert was on Sunday afternoon at a church in Tarentum (Central Presbyterian), which is about a half-hour away from Pittsburgh. It is a small town and the folks there seemed to really appreciate having a concert. The church has had one for a few years, and uses the radio station to promote their events, so one morning Lenny and Dave Rankin and I found ourselves in the basement of WQED talking into a DAT recorder with Jim Cunningham (the host of the morning show and Pittsburgh Symphony broadcasts) recording a podcast for the "voice of the arts" which is dedicated to promoting local events. It was pledge week so we all gave our best spiel about why YOU should SUPPORT THIS STATION! Apparently at some point last week I could be heard on the radio exhorting Pittsburghers to support classical radio. I hope I didn't drive too many of them away! I don't have any pictures of this concert, which was given by my two colleagues at Third church and myself, Raquel Winnica Young, soprano, Lenny Young, oboe, and I on the 9-rank Wicks organ. It was a nice little instrument. Since I have been learning to tame the beast at Third all the organs I have visited lately have seemed a little smaller than they used to, but that doesn't mean they don't have their own challenges. That's us when we gave a concert at Third church. Our big knock down choral extravaganza at Third was in November so Lenny and I can relax a little bit as the holidays roll on. 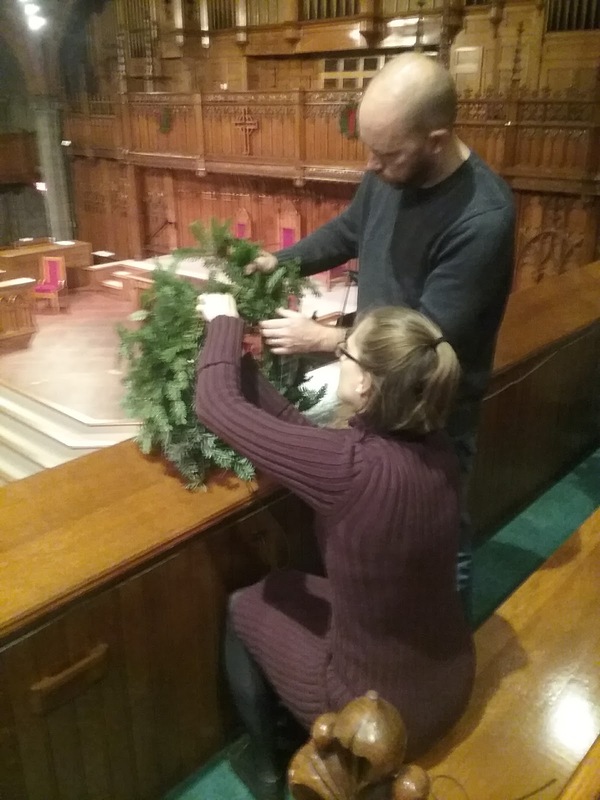 We have a children's pageant this Sunday in which we play minor roles, and then Christmas Eve is coming in a week with a guest ensemble and all of those carols we haven't been singing yet because we are liturgically aware. And also because I haven't been shopping yet. Just a reminder, the holiday program is still up at pianonoise radio for the next 10 days. Enjoy the sounds of the season (for free!). See you next week. I've been sharing some personal memories of the music I've assembled for the holiday season that you can hear all this month on Pianonoise Radio. All of the recordings date from before our move to Pittsburgh, my cancer, and my job change. 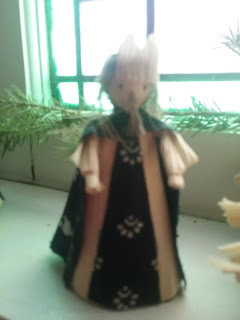 I have started to make recordings again, and some of them have begun finding their way to the web; however, it will probably be next year before I add any of them to the holiday program. We left off right before the Liszt piece, "The Shepherds at the Manger" which is a little thing based on the tune "In Dulci Jubilo." I discovered its existence while reading a forum question posed by a piano teacher who was trying to find some "Christian" music for piano that he could stand, and while the efforts of the various (probably non-Christian) parties involved to find something classical and church-appropriate was fairly amusing, there were some suggestions that bordered on useful--at least this little guy could come in handy at Christmas. However, my efforts to record it were racked by even greater comedy, as you can read here. I think it may be one of my favorite blog posts. 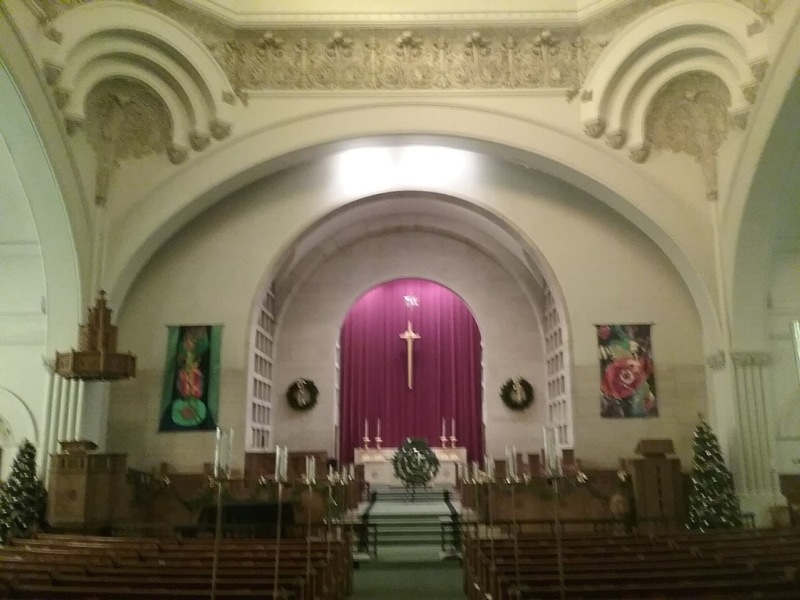 The two books of Bartok carols were recorded the same year, the year that our church sanctuary got new carpet in the middle of Advent, which made things difficult, since in the busiest season of the year I didn't have access to the organ for nearly two weeks. Recording was also difficult since the better piano was also buried under a pile of debris for the duration. I managed to hack out this recording in such a hurry I think I might have only had one day to learn the piece, which accounts for a couple of mis-readings and one place where I left out a line of one of the carols! I still like the recording, though. Bartok gives me something very different to listen to during this most hackneyed of musical months, though I suppose the rest of the populace would rather listen to the same popular songs and occasional carols all the time. Oh well, it is my website, and you can skip it if you want. I like it, anyway, and since familiarity is nine tenths of the law in music, you probably will too if you listen to it a few times. Unfortunately I can't find the words to any of the carols. Call it OCD if you will, or just rampant creativity, but the Tunder Canzona comes with special features, such as being able to hear it from different locations. I've explained it all in this blog. Listening to the meditative beauty of Bach's next version of "Now Come, Savior of the Nations" it is hard to believe that I spent several minutes before the recording desperately trying to kill a grasshopper. It was hiding under one of the windows of the sanctuary and it would not shut up so that I could record in peace. Eventually it did, which is good; I never did find it. If the title seems a little familiar it is because it is based on an ancient advent hymn and Bach himself wrote four organ settings of the same hymn. This one is the most often played by a mile, being so peaceful. I'll be playing it next week in church for what I think is the third time. I try not to repeat selections very often which is why the last time I played it during a Christmas season was 2008. The present recording I think comes from 2011 and was made during the summer (hence the grasshopper). This is often the best time to record Christmas music as I am much too busy in December. If we go back into the eons of time; that is, to my teenage years--I had a tradition of Christmas improvisations. I would take several carols, and make up my own arrangements of them in front of a tape recorder. They ranged from melancholy to ridiculous. I do less of that now, but one year, after continuing to struggle with the shrinkage of time during the holidays, I revived the practice, and several of the remaining pieces are improvisations. The good news is that after years of practice I can make up something on the spot that sounds reasonably close to a printed composition. The bad news is I was trying to sneak it in between rehearsals and concerts, and wasn't always at my best. I think five of these were made at once one morning just before a staff Christmas lunch. I've since written some of the them out for further use and even played one on Christmas eve from the (partially completed) score (not enough time!). Some of the meanderings and hesitations will disappear then. I also find improvisations can be a good starting point for an actual composition later--provided I can remember them, or happen to record them, which isn't likely except at Christmas. If you take delight in the "authenticity" that is the actual unfiltered moment of inspiration, then these last pieces are for you. I'll be bringing my recorded to church this year too, to capture the moment. I'll also be going back to some of the music I played during my college years, and graduate school, to remind myself of more Christmases past. The funny, the bizarre, and the annoying, all are part of the history of these recordings, but while these words may give you a back stage glance into the messy reality that is a life in music, it is the music itself, evocative of peace, love, hope and joy, as well as melancholy, drama, and wonder--this is my Christmas present to you. This year and every year at this time as we examine ourselves we reckon with and see more clearly our passage through the portal of time. The music will be here next year too, I hope, but with some additions from this next chapter of my life, which is just beginning, in the building at the bottom of the page. Have a Merry Christmas, and if you don't celebrate Christmas (or even if you do), may you have peace, joy and love. These notes concern music from the Pianonoise Holiday program for 2017 which you can access right here at Pianonoise Radio! Happy listening. The 2017 holiday program begins with a setting of "Now we sing of Christmas"--a piano piece far more modest that the vast, difficult Dupre organ setting I keep meaning to get around to each year. But even that was two years in the making. Like most of the pieces you are about to hear, this was recorded during my years in Illinois, during which the Christmas season was so busy that I sometimes only had time to jot down ideas for compositions while running down the hall between rehearsals. Thus, I began the piece one year, and, at about the 56 second mark, when I get to the bottom of that run, that's the following year when I picked the piece up again and finished it one evening in a lounge at a nearby church in a spare half hour (a luxury!). Good times. 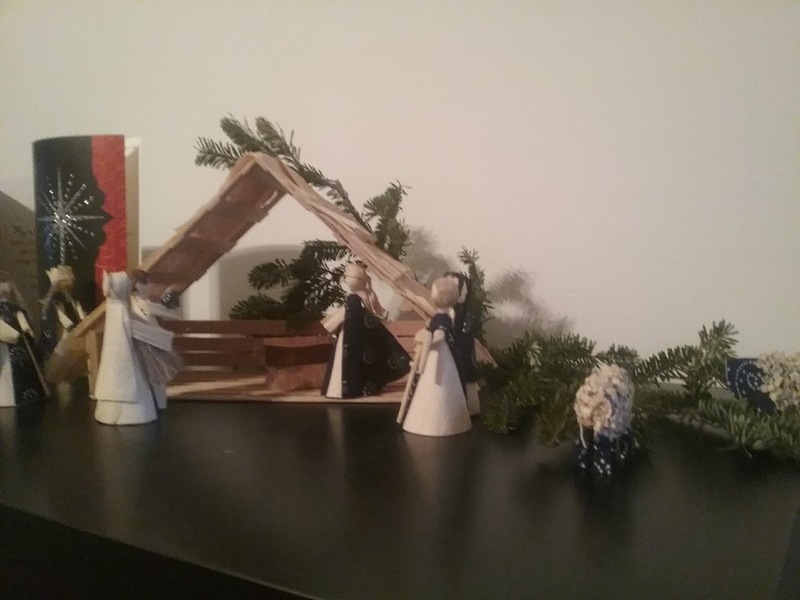 I don't know when exactly I decided to pair it with a charming little piece by Edvard Grieg that has nothing whatever to do with Christmas, but I think it turned out well. It seems to be in the same spirit. The organ piece that follows (Invitation) was recorded on an organ in need of repair (and soon to get some), which a tonic G that wouldn't sound. You can read about the hilarity of that recording sesson here. I like to go hunting all over the world, and one fellow in Lithuania has an organ blog on whose sight I often get ideas. 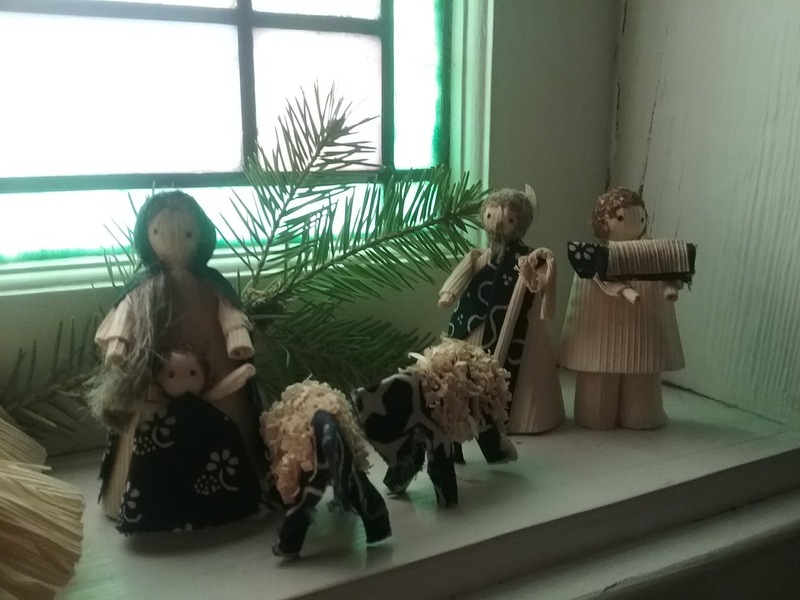 As a sight reading exercise he once posted something from a Croatian composer I'd never heard of, and although I didn't care for that piece particularly, I went on IMSLP and discovered four delightful little Pastorales that I played for Christmas in 2016. The Bartok Carols came over the radio once when I was out Christmas shopping. Several years later I recorded them myself, complete with an outtake that featured some jingling bells. 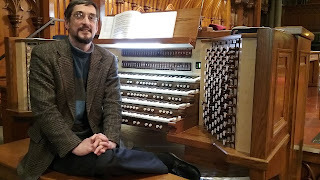 By the way, regarding organ repair, I used to have fun with the playback system--the pipes didn't care whether I was playing them live or had pre-recorded the music. 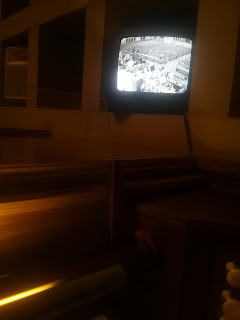 I would often record a performance at the console on the playback system and only later get out the microphones to capture what I had played earlier with my digital recorder, letting the organ play my performance back for benefit of the microphones. Thus, in one of the two Pastorales (the one in C) that I didn't include in the program (but you can find on the mp3 Index page under Pintaric), the custodian is actually running the vacuum cleaner while I am recording my performance at the console (but not during the actual through the air recording which was done later) and in the one in Bb that you are listening to I didn't have time to make all the necessary stop changes so while the sound was being fed to the microphone I posed as my own organ assistant and pushed in and pulled out the stop knobs as needed while the the organ played--this is like playing a duet with your past self (which I have also done). I enjoy musical detective work but I had a heckuva time tracking down the music for Samuel Wesley's strange and interesting digressions on the old carol" God Rest Ye Merry, Gentleman." Eventually I found a professor in Maryland who had recorded the music, emailed him to ask where I could find it, and he kindly sent me a copy. It was from a volume that was no longer in print. A year later I found myself at a table in my own church next to the musicologist who had edited the volume! If only I had known sooner I could have saved a little geography. I'm going to skip the next three pieces except to mention that the Marteau was written in quite a hurry and recorded before an unrelated concert. The Gigue fugue is called that because there is quite a lot of delicious dancing about in the pedals. About a third of the way through the recording I discovered that one of my shoes had come untied, which made for a rather uncomfortable two minutes--but I went ahead and finished it anyhow. I usually do a few takes, but the runner up (or was it slightly better) featured someone dressed as Santa coming into the sanctuary with bells ringing loudly and basically wrecking the end of the recording (which I never let on; I mean, it was Father Christmas, after all). Gottschalk's Cradle Song reminds me of Christmas Eve 2010 which might just be the best one ever, with a foot of snow outside and easily the best Christmas present I ever gave my father (or perhaps anyone)--for a more expanded version go here. 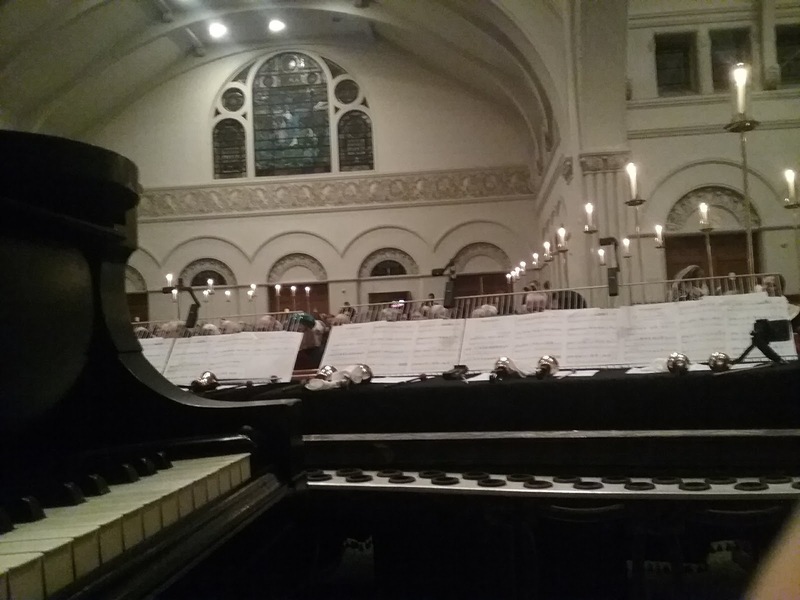 During the Gottschalk prelude you could have heard a pin drop which is unusual for any audience, particularly at the start of a church service, and a downright miracle with a sanctuary full (300?) of families for what I always thought of as a pretty zooey 7:00 service. 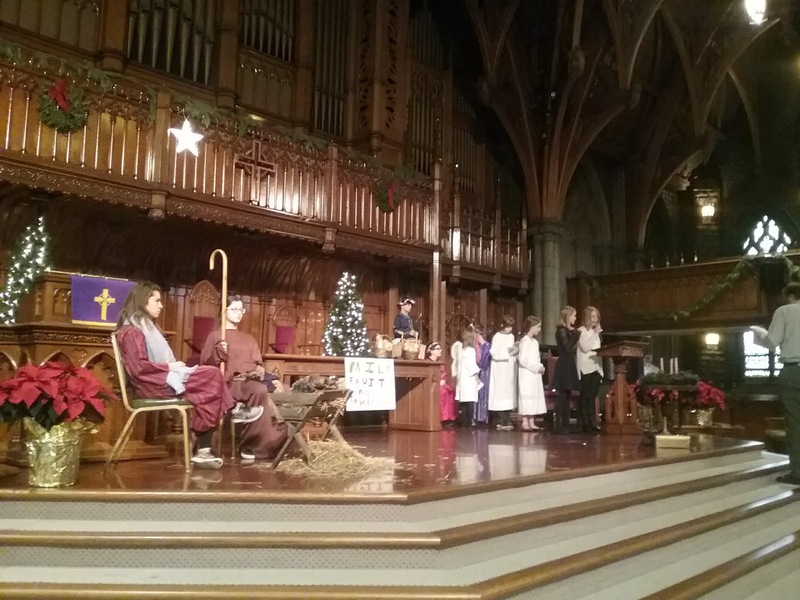 It was less miraculous, but just as special, at the 11pm candlelight service later on. I've been playing the Bach Pastorale on and off ever since my first church appointment as a teenager, at a little church in the burbs a college friend called the "Fisher Price" church because of its size and primary color scheme. 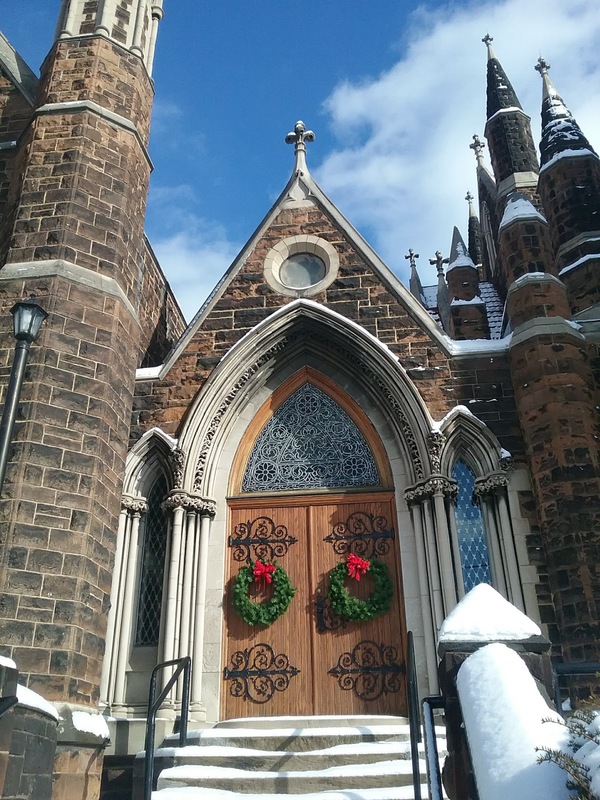 It had been a tradition of the former organist, who referred to the organ there as "the eight-rank wonder." I've graduated to bigger things of course but next week I'll be playing a concert out of town that isn't much larger (a 9-rank Wicks). 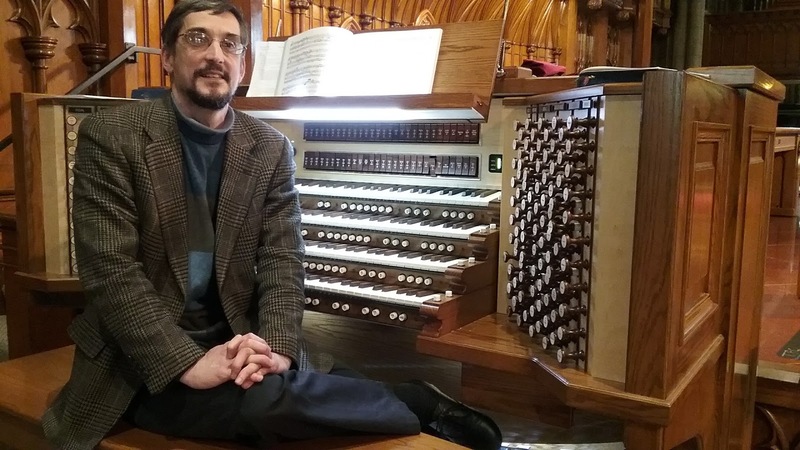 Small organs can be charming if they have a pleasant complement of stops. I'm looking forward to it. I sense your attention is waning (or mine is) so I'll save the remaining commentary for next time. I've come across a lot of different personality types in my journey across life, as I'm sure have you. Some are pretty negative about the way they see life, feeling continually shat upon and thinking that everybody else has it easy and they don't. This seems like a majority opinion. There are varieties of hall-full/half-empty combinations, and some folks who aren't so easy to categorize because they seem to change their ideas once in a while. And then there are a very few people who are not only quite positive about what they think life can be and what they can get out of it, but they spread that joy to everyone around them and cause improved performance and improved attitude from everyone with whom they come in contact; they are liked by virtually everybody. I've had to privilege to know a few of these people. When they are in the room everyone else seems to be able to ride on their encouragement like a wave or warm themselves in the rays of their sun. Have you ever wondered how they got that way? I'm not talking about Pollyannaesque denial of reality, either. These folks seem to be pretty grounded in gritty practicality, too--it's not that they don't know what stinkers we all are, it's that they know how to steer the other way and in the process get us all to go there as well, at least for a while. While I was in chemo I experienced a pretty wild ride on waves of despair and exuberance. Every time I got intentionally poisoned for 5 days in a row things got really ugly for a week or so and then, right near the end of a cycle I'd slowly come out of it and feel my body roar back to life. I'd try to eat everything in sight to put back the several pounds I'd lost, and resume community with the people I couldn't see while I was under the waves. As we were in the middle of a move to another state, I was saying farewell to the people I'd know for the last decade and also leaving my jobs. Those days were full of major occasions like last concerts, church services, and a graduation. These were occasions that would have felt epic under normal circumstances but now they felt enormous. If you ever wanted to experience huge waves of gratitude for being alive this is one way to experience it. Not that I'd recommend it. It occurred to me to wonder whether whether this sort of experience wasn't in the biography of every larger-than-life optimist; dark days that had given rise to a great victory; personal struggle with demons vanquished and a sense that everything afterward is a privilege that never lets up. I wondered if it would change me. I don't think it has, really. After the chemicals wore off and life resumed some sort of normality the soaring movie music began to fade. However, as I explained to a friend who asked, there are two addendum to note here: one is that, well before cancer struck I had a sense that I wasn't going to live forever, that life is fleeting, time is precious, and if you have something to do you'd better do it and not dilly around because you never know. The other was that life is a gift and being able to do what I do is awesome. 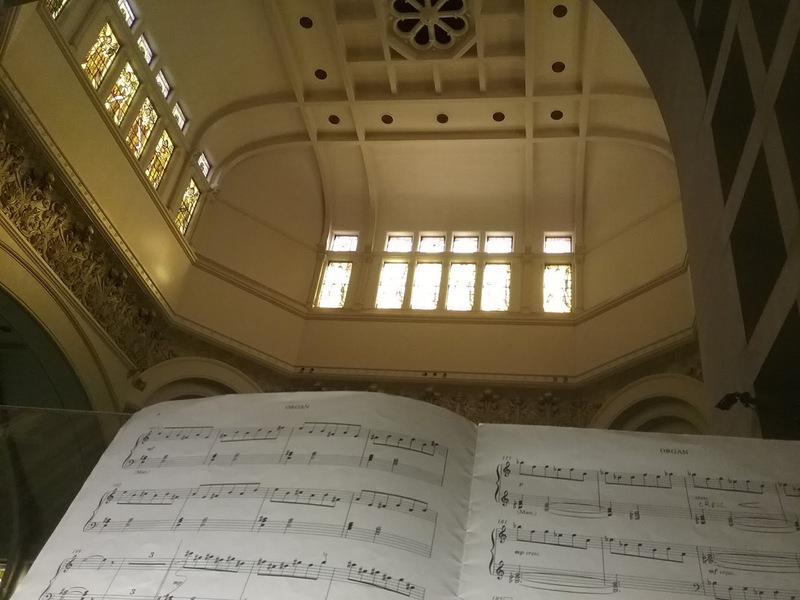 I would bound up the stairs to the sanctuary every morning looking forward to the practice ahead, know that it would eventually get difficult and onerous but that I'd emerge with a new swath of music in my head and heart and loving the process, or at least the results. So the two cliches were already in place: I wasn't taking life for granted anyhow, and I was motivated by both the joy and the scarcity. Thus, not only do I not detect a huge change in outlook, I'm not sure there was much room to go in the that direction. But I may have gotten even more focused and more gratitudinous (sorry, but how do you make that a noun?)*. Still, it's possible that there has been some change. A larger-than-life friend I talked to after the treatments thought the experience might change my music. Only recently I've begun to noticed a compositional shift taking effect, and I don't know where all of its roots lie. Perhaps. I also seem to have registered as a friendly, positive person among my new associates in my new environment. It is somewhat of a surprise to be told that, but then I had been working at it. Which is basically my point this morning. Outsiders to music tend to think--and share with those of us who are practitioners--that some of us were just 'born with it' and that it just 'comes naturally' as you shake the magic notes out of your fingers. Those of us on the inside know how much hard work is involved: thousands upon thousands of hours of practice, thing building upon thing until sometimes it actually is pretty easy, but you have to go a long way to get there. And sometimes it is still very very hard. Why should it be any different with attitudes? The mysterious alchemy that goes into great achievement is not so easy to define. Surely there is some native talent for whatever we do. Then there is opportunity, which may be defined as the experiences we have that allow us to grow, some of which may be unpleasant. Then there is the daily work to take what we have and see what we can do with it. It is only the last of these that is under our control, and for that good reason is the one on which achievers tend to focus while others get caught up lauding the other two. I can, of course, feel lucky to be in possession of the first two: grateful, if you like. And then spurred on to respond to those gifts by adding one of my own: saying yes to them in real time. And my readers can respond in at least two ways as well: as a feel good piece about the joy of life or having a positive attitude or something else we all knew already but enjoyed having affirmed, or...you can work to make these things (in the phraseology of Wallace Stevens) your "gradual possession." Not something you have to jealously guard or fear the loss of, but something you can joyfully give away. *Grateful. But that isn't as much fun. "At the midpoint of life's journey, I found myself in a dark forest, for the clear path was lost"
I like to plan ahead whenever possible, and since 90 seems like a good life span, I thought, when approaching 45, that I should plan for a concert which I planned to call the "halftime show." Some wags might point out that there is no guarantee that I would have gotten that right; perhaps I would be enjoying myself too much at 90 and decide to live longer, but in such a case I had a ready answer for them, borrowed from the world of sport: "sudden death overtime." That would have gotten a mirthful response had I gotten to opine that into a microphone at the planned but ungiven concert, but, as it happens, I was a little busy trying to fend off an early end to the festivities. Cancer struck. It was one of the better kinds, if you are planning on getting it. Rare, but no more a friend of chemotherapy than was its host. The thing did as promised, and melted away, which was good, because when we found it it was the size of a small football in my chest, trying its best to exercise eminent domain on my heart and lungs. I couldn't take a regular breath, and my exercise regimen was going from Marathon to Couch, which is backwards. I spent the better part of March 2016 preparing for an early grave, and then, when the diagnosis came, trying to deal with a very aggressive program of chemotherapy, designed for getting rid of large tumors in no uncertain terms, for those with lots of life ahead of them if only they can survive being poisoned for a few months. I have spent most of my life fearing chemotherapy out of the corner of my mind. I've heard nasty things about it; I hoped that some of those miraculous advances in cancer treatment that we keep hearing about would have taken hold if and when it got to me. But alas, no. There are many side effects which I now know from experience. Every system in your body is turned upside down. You can't sleep because you have to evacuate fluid every hour; also because some of the pills to take care of the nausea make you very restless and others very sleepy so that you are generally both at once. You can't tell if you are hungry, so you just have to guess, force it down, and if it comes back up you were wrong. Then there is pain in your bones, your chest, your muscles, and, if you are as lucky as I was, you can't stand light and have to keep your eyes tightly shut for days at a time while you lie there, unable to pass the time with a screen of some sort. The bulk of that turmoil ended over a year ago, and I've written about it on another blog. My rehashing it here is simply to serve as notice as to why it has been so long since my last confession blog and to further explain why, for the next month or so I plan to blog only on Fridays, and then in a largely autobiographical manner, as if I have some catching up to do before deciding when to attempt to return to what this blog was originally designed to do--share piano music on Mondays, help musicians on Wednesdays, and discuss organs and church music on Fridays. It still seems a bit daunting as I write this, but I'm feeling better now, and I've been fairly productive lately, so...perhaps. One of the surprises may have been how long it has taken me to fully recover, and how many times I thought I was back on my feet only to find a couple of months later that I was more recovered than the time before which retroactively meant I wasn't in as good shape as I thought I was. This time, I thought, I'm Really recovered! In the middle of all the muddle we moved so my wife could take up new employment in another city, which meant I had to leave my jobs and community and start over. I'm still working on it. Next time I will probably talk about Pittsburgh. Pianonoise the website has had a rebirth as well. I will update that on Fridays also. It has a calendar of events (I have just had two concerts and two more are coming up this semester), a weekly recording, which for now involves recycling of a lot of material (31 hours) generated in Illinois, with the promise of more to come from Pittsburgh in the new year, and links to various articles, new and old, and of course, this blog. It will be good to share life and music with you again.